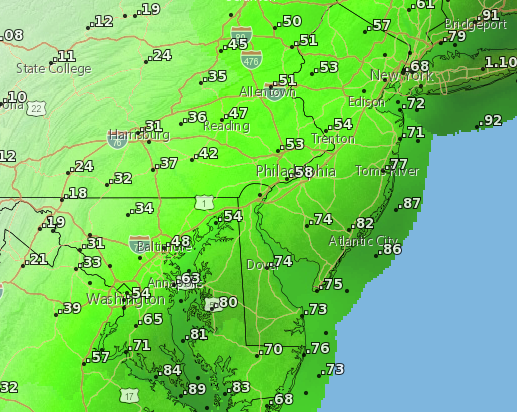 An impending storm will bring inches of precipitation to the Jersey Shore over the course of two days – but despite having just experienced temperatures in the teens, the storm will be a rain event only. Still, forecasters say, there is a chance for flooding in low-lying areas as well as winds that could whip up light objects. According to the National Weather Service office in Mount Holly, rain will arrive Wednesday night and linger into Thursday. The overnight low between Wednesday and Thursday will be around 46 degrees. It will be breezy with a south wind 21 to 24 m.p.h. with gusts as high as 37 m.p.h. About a quarter of an inch of rain will fall overnight while the bulk of the precipitation will come through during the day Thursday. Thursday’s high will be 51 degrees, though the temperature will dip below freezing Thursday night. By that time, however, the rain will have moved out of the area. The sun will return Friday.